It is summertime and that means cold treats/desserts are the best. And with summer being the busiest time of the year it is great to have recipes that are easy to make and ones that come together fast. 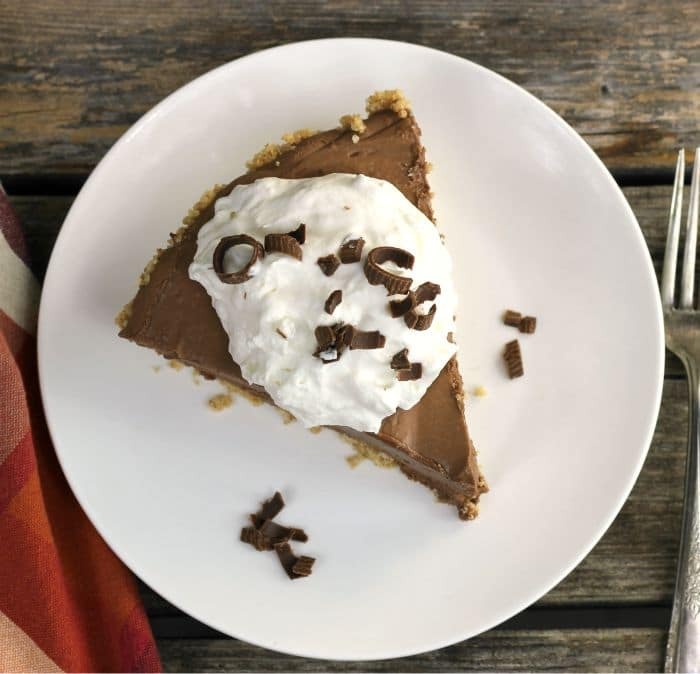 There is no denying it I am a chocolate lover, so this pie is right up my alley. It’s a good thing that my kids share my love of chocolate because I could see myself eating most of this pie all by myself. 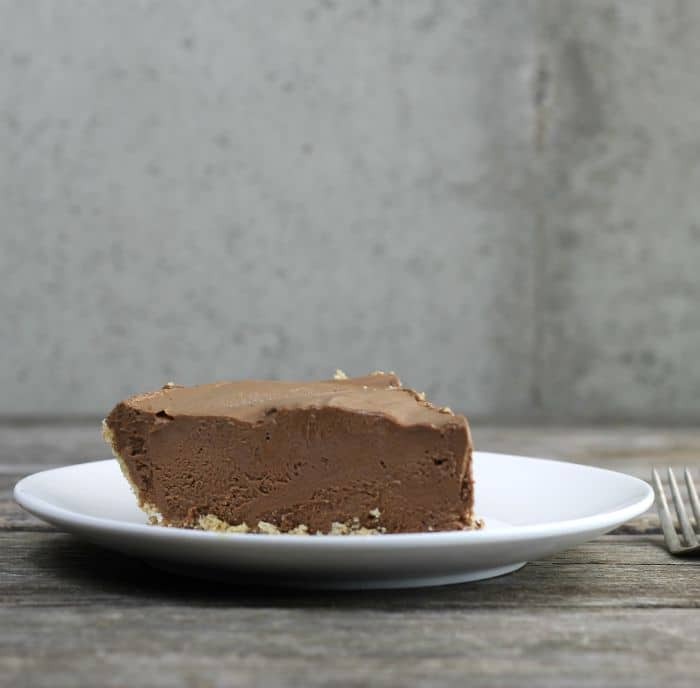 The pie has a chocolate filling that is creamy rich, it’s almost like eating a decadent chocolate ice cream. I like to top the pie with a dollop of sweetened whipped cream, but it is not necessary. My daughter prefers the pie just as it is. 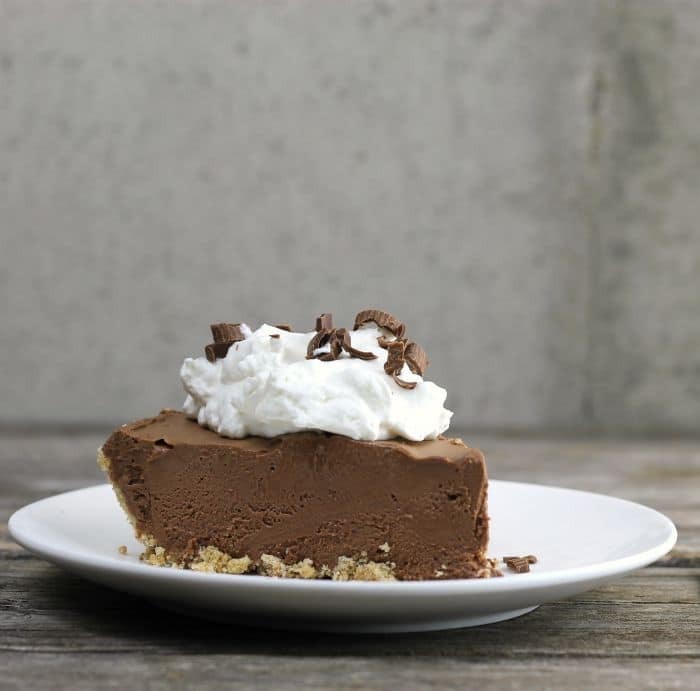 Start out with making the graham cracker crust or if you prefer you can buy a premade crust. Next, you will take some heavy cream and bring it to a simmer. Once the cream comes to a simmer remove the cream from the heat, add the chocolate chips and put the lid on the saucepan. Let the cream and the chocolate chips set for a few minutes, so the chips can melt. Stir until the two are blended together and set aside to cool. Then beat the cream cheese, add the sugar and mix in. Add the cooled chocolate and mix in. Beat the whipping cream until you have stiff peaks and then mix it into the pie filling. Add the filling to the pie shell and chill at least 4 to 6 hours before serving it. In a small saucepan bring 1/2 cup of the whipping cream to a simmer. Once it comes to a simmer remove from heat and add the chocolate chips. Cover with the lid and let sit for 2 to 3 minutes or until the chocolate chips are soft. Stir until the cream and chocolate are mixed well. Set aside to cool. In a medium bowl beat the cream cheese with an electric mixer until fluffy. Add the sugar and mix in. Mix in the vanilla. Spoon the cooled chocolate mixture and mix well. In a clean bowl with clean beater whip the whipping cream until stiff peaks form. Add the whipped cream to the cream cheese mixture and mix in. Spoon the filling into the pie shell. Place in the freezer for 4 to 6 hours or overnight. Optional: serve with whipped cream and chocolate curls. 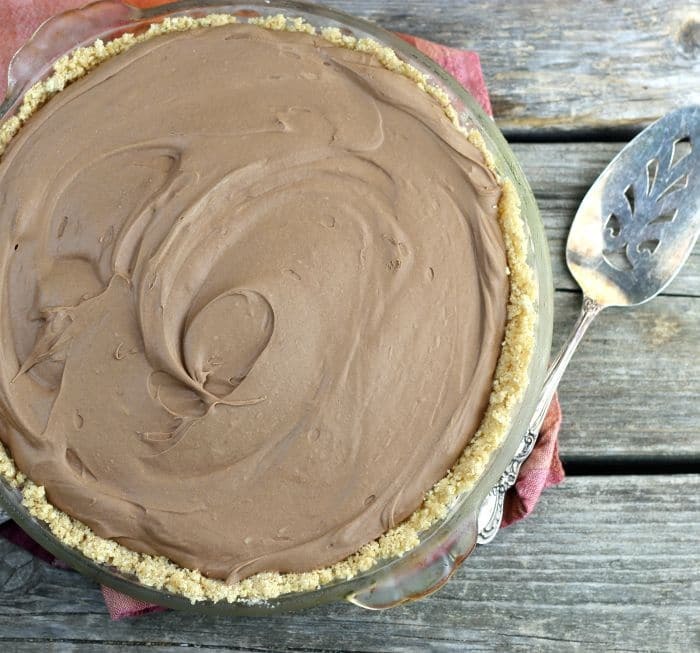 I’m a huge fan of graham cracker crusts, and this pie sounds delicious for a hot summer day! I know my family will love this! A dreamy summer dessert! This pie is WONDERFUL!!! I top it with Strawberry Pie Filling.